Riding to the Korea International Boat Show from the city of Suwon, about an hour outside Seoul, the bus rolls along congested city streets filled with people going to work in shops, stores, office buildings and factories. Gradually, the bustle of the city gives way to rice fields, where farmers tending their crops occasionally look up at the passing traffic. After about 90 minutes of driving, visitors know from the balloons floating high in the blue, cloudless sky that they have arrived at the site of the show, nestled near Jeongok Marina and Harbor and Tando Port on a huge expanse of land that was once a military base. The show is in the populous Gyeonggi Province on South Korea&apos;s "Gold Coast" - a region that, including the city of Seoul, is home to about 24 million people, nearly half of the country&apos;s population. Walking across a dusty parking lot, it&apos;s easy to see this is nothing like a U.S. boat show. There&apos;s no convention center, no large in-water exhibit with hundreds of boats, and the number of people filing into the exhibit halls is nowhere near that of the big shows in Fort Lauderdale and Miami. Soundings Trade Only spent three days at the show, which ran from June 9-13, as guests of the event&apos;s organizers. Neatly dressed women in matching skirts, blouses and heels - under tents for protection from the hot early-summer sun - welcome attendees at the gate. They smile as they hand out brochures advertising the dozens of ongoing activities. The Korea International Boat Show is a component of a waterfront festival, and once inside the venue, visitors are welcomed by a parade of musicians and dancing costumed characters. 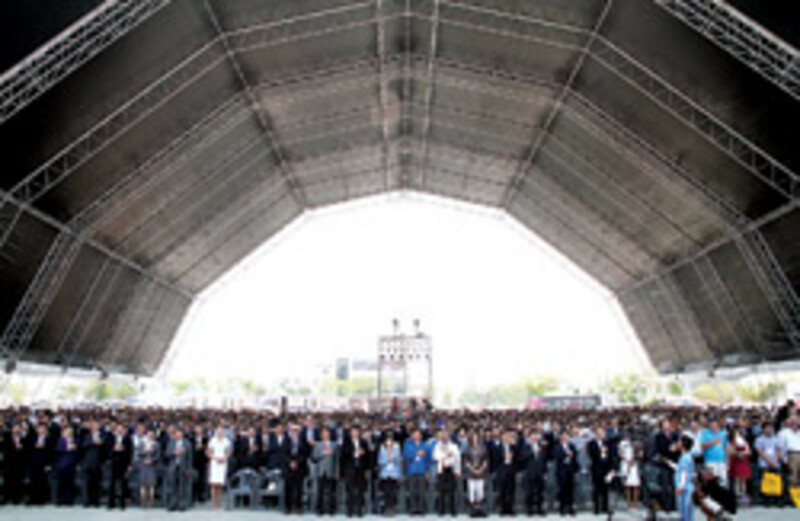 A two-hour opening ceremony, attended by more than 500 people, includes honor guard and military band performances, singers, martial arts exhibitions, fireworks and speeches by government officials, including Moon-Soo Kim, governor of the province. It&apos;s quite a contrast to the ribbon-cutting ceremonies one might see at a major U.S. show. Within minutes of entering the show, it&apos;s clear this is a country and a people who are serious about becoming a part of the global boating community. 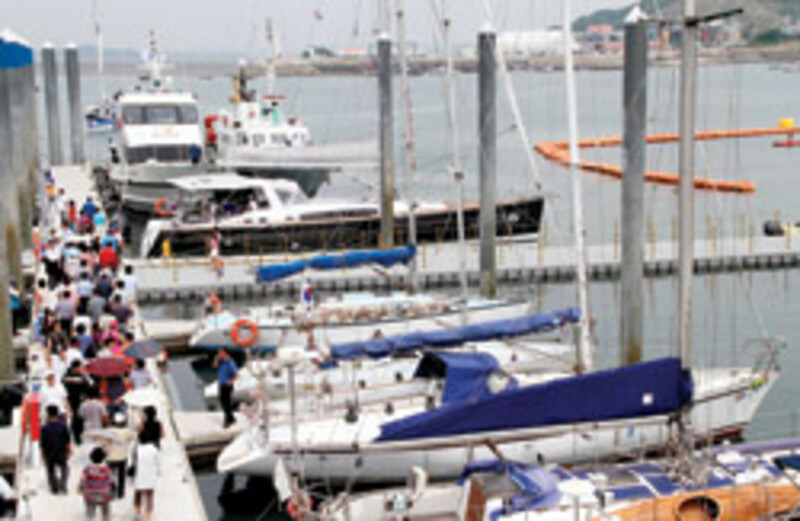 In the last few years, South Korea has begun seriously investing in the development of a recreational marine industry. Officials believe three elements working in tandem will help create a successful industry: infrastructure, tourism and cultural activities. Among the projects being undertaken are the development of 43 marinas throughout the country by 2019; the construction of an $18 billion waterway project, the Gyeongin Canal, which will link Seoul with the Incheon coast and allow access to the Yellow Sea; the restoration of four major rivers, on track for completion in 2012; and the development of a marine industrial park in Gyeonggi Province, with generous incentives offered to foreign companies, such as a 100 percent exemption from corporate income taxes for three years. Already in place are more than 15 active sailing schools in various parts of the country, and there are plans to develop several water-sports centers like the one that opened near the site of the show following the 2009 event. All of this is in addition to new laws that have been passed or are in the review process that should encourage recreational marine industry development. These include a relaxation on the restrictive standards for the production and inspection of leisure boats and a reduction in the acquisition tax on recreational boats. And events such as the Korea Match Cup - Stage 3 of the ISAF World Match Racing Tour - which takes place alongside the boat show, are an integral part of promoting the boating lifestyle. "I am really impressed and it feels great to see that the status of the Korea Match Cup and recognition of Korean yachting is on the rise throughout the world," says event promoter Dong Young Kim. "The long-term goal for Korea Match Cup is that it will attract further sports and provide an opportunity for the Korean marine sports industry to develop further." All of this activity is already having a positive affect on growing the industry, according to information provided at an investment seminar presented at the show. There has been an average annual increase of 8,200 in the number of "rowing licenses" approved by the government, and the number of recreational boats in the county is annually increasing by double-digit percentages. However, there are currently only 11 functional marinas, which can accommodate 1,044 boats, and about 700 skilled workers for the industry, and that will need to increase to meet the demands of a new boating public, according to Seong Chil Kim, a director with the Ministry of Knowledge Economy. Marine tourism and the marine industry have a high value and strong "backward and forward linkage effects," according to a statement read by a representative from the country&apos;s Ministry of Land, Transport and Maritime Affairs during the opening ceremony for the five-day show. "Korea is [the] No. 1 shipbuilding nation, No. 5 in maritime transport and No. 13 in sea products," the representative continued. "Considering this strong marine industrial power, as well as our unparalleled IT power, Korea has high potential and capabilities to further advance its marine tourism and related equipment industry. As such, the government has a clear vision and strong will to advance our marine industries." The Koreans have taken an if-you-build-it-they-will-come approach to developing their marine industry, whereas in the West, infrastructure such as marinas and launch ramps are developed out of need, says Tim Coventry, an industry veteran based in the United Kingdom who advises the provincial government on the boat show. In South Korea, the belief is that once marine infrastructure is in place, people will become more interested in boating. There&apos;s evidence that philosophy will work, says Coventry. When Jeongok Marina opened last year, its 60 berths were filled in about eight weeks. All of the slips for phase two of the project - which wasn&apos;t completed at the time of the show - are already accounted for. There are just 20 boatbuilders in South Korea, compared to 1,305 shipbuilding companies. There are 35 companies that sell boats and engines, and 350 other marine-related companies, most of which are service providers for fishing and diving, according to Jong Gye Shin, a professor at Seoul National University who spoke during the Asia Marine Conference that took place during the show. Of the country&apos;s "registered ocean leisure equipment," 7,518 are "rafting boats," 1,174 are powerboats and 30 are yachts. Shin admits that changing people&apos;s mindsets may be one of the more difficult aspects of building the industry. He says people ask him why "do yachting - you can just do fishing." His answer: "You just love the feeling you experience on the ocean by riding in a boat. We need to create demand. We need to create opportunities to get people on the water." One of the best ways to get people interested in boating is to introduce them to it at a young age. 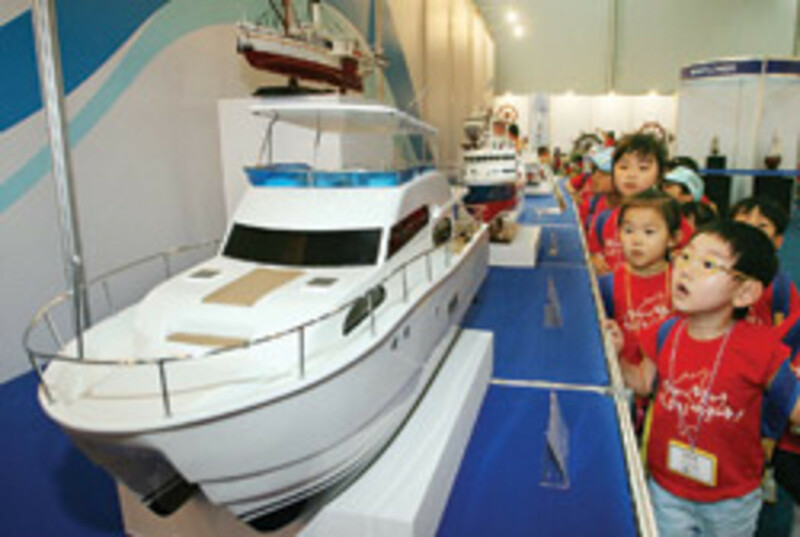 The boat show was packed with children and they weren&apos;t just there for such activities as model-boat building, bumper boat rides or arts and crafts. They walked around the exhibit halls in groups, looking at boats. They had their photos taken in front of sailboats and powerboats. They stared wide-eyed and pointed excitedly at the colorful displays. A new generation of boaters in the making? Convincing foreign companies to get in on the ground floor of the South Korean boating industry may be a tough sell, many admit. "We live in a culture of short-termism," says Coventry. "If I invest $100, how quickly am I going to get it back and what&apos;s going to be my return? Return on investment is important. It&apos;s important everywhere, but here they take strategic views on investment that they need to make to get to a different stage. That&apos;s their history. That&apos;s their culture." Look at where South Korea has come since the Korean War ended, he says. "You have to think of Korea&apos;s history," says Coventry. "Sixty years ago this wasn&apos;t even a Third World country - it was ashes after the Korean War. Out of those ashes has come one of the most modern countries." Last year, Julie Balzano led a Florida delegation comprising seven companies to the Korea show - five exhibitors and two buyers. Balzano is director for Mexico and the marine industry sector with the International Trade and Business Development Unit of Enterprise Florida. For marina developers or dock accessories manufacturers, she says, the return on investment may be shorter than for others in the industry, but it still takes a long-term commitment to do business in South Korea. "For some [companies], they feel it&apos;s too much to bite off at this point in time, knowing it&apos;s such a long-term payoff, given the state of the economy," says Balzano. "I believe that it has tremendous long-term potential. It isn&apos;t going to be the quickest return on your investment. Until you have the infrastructure in place and the roads in place and the marinas and the ramps, no matter how many boats you try to sell and boats that people may buy, if they can&apos;t use them it&apos;s not going to be an ongoing opportunity." Gary Abernathy, who came to the show in 2009 with the Enterprise Florida group, returned on his own this year as a buyer. Abernathy is president and CEO of Praktek, a Coral Springs, Fla.-based company that makes inflatable yacht fenders under the Aere name. He has vendors in South Korea and has been doing business there for years. He says it&apos;s a shame more of his compatriots didn&apos;t make the trip and wishes U.S. trade groups had been more active in letting their members know about the show. "We should have as much representation as the Australians," he said at the show. "The Russians have more people here than we do." The National Marine Manufacturers Association says it sent out a mass e-mail promoting the show and included it on its worldwide calendar. "We were unable to organize a U.S.A. pavilion this year, as most members were not able to participate as a result of the economy," the NMMA said in an e-mail to Soundings Trade Only. 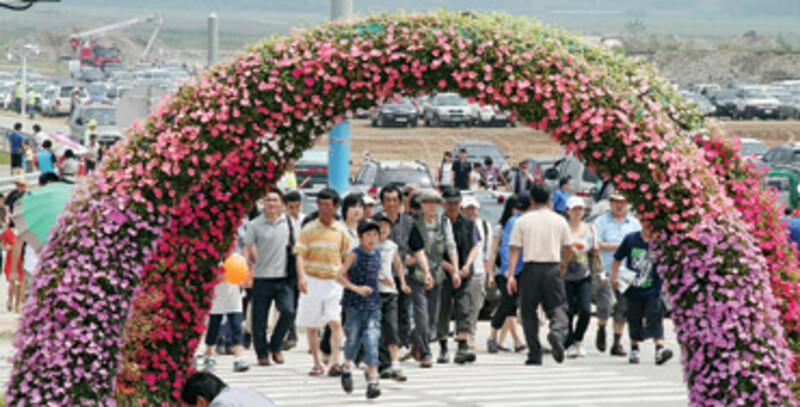 Show organizers offered generous incentives for foreign visitors. For example, overseas exhibitors were given seven free nights in a hotel, plus a free 9-square-meter booth. Foreign investors and buyers received three nights in a hotel and 50 percent off round-trip economy airfare, capped at $1,000. These incentives are expected to be offered again next year, Coventry says. Abernathy and others say it&apos;s well worth the time, effort and money to come to the show. "The Koreans have more disposable income all the time and they&apos;re looking for ways to spend it," Abernathy says. "The opportunities are here if people just take advantage of them." Ernie Ellis Jr., president of Baltimore-based Sea-Fire Marine, was at the show for the second time, having attended the inaugural event in 2008. Ellis has been doing business in South Korea for more than a year and agrees that infrastructure needs to be in place to support the industry before any real return on investment can be seen. However, he is confident it&apos;s coming. "I think that they&apos;re going to be successful," he says. "We see some good opportunity there." In the exhibit hall, there were plenty of U.S.-built boats. There were Brunswick brands, including Sea Ray and Boston Whaler, as well as Regal, Chaparral, Cobalt, Larson and Glastron, among others. Yoon Hee Won says his Seoul-based dealership Best Marine sold five Cobalts and several Larsons this year. Su Lin Cheah, director of recreational marine in Asia for Brunswick&apos;s Asia Pacific Group, says Brunswick has been operating on that continent for about 30 years, and in Korea with Sea Ray and Boston Whaler for about 10 years. Brunswick also sells Bayliner, Trophy and Meridian boats in South Korea, as well as Mercury Marine engines. The Asian market in general has been a "very consistent market for us, especially in the sportboats and cruisers," she says. Cheah also cautions that doing business in South Korea is a long-term investment and says government involvement and support will be key to getting the industry off the ground. "Korea is of interest to us because of the proactiveness of the local governments," she says. "You need that involvement." Some may perceive South Korea as unsafe because of its neighbor to the north. While recent events may have done little to change these perceptions, visitors will experience a South Korea that is modern, vibrant and technologically advanced. Less than three months before the boat show opened, North Korea was accused of sinking a South Korean warship, killing 46 sailors. North Korea denies involvement, but the event set off a war of words between the two nations. In mid-June, North Korea said it would unleash a "merciless strike" that could turn Seoul into a "sea of flames" if South Korea turned on propaganda loudspeakers not far from the Korean Demilitarized Zone that separates the two countries. The Korean War ended in 1953, but the sides never signed a formal peace treaty, and tensions run high as South Korea prospers and North Korea struggles financially, increasingly isolated from the world because of its policies. Despite the friction, South Koreans don&apos;t seem overly concerned that such issues will impede their country&apos;s growth. In 2006, for example, the central government opened the coast to private boat owners and in early 2007 began taking down wire and other defense mechanisms to allow access. These areas had been restricted zones available only to licensed fishing boats, security personnel and the military. Despite tensions between the two Koreas, Gyeonggi Province Gov. Moon-Soo Kim says South Korea has developed and flourished. He was emphatic that the divide should not keep foreign companies from doing business in his country. Approximately 22,400 people explored the exhibit halls at the Korea International Boat Show this year, according to organizers. This was the first year organizers could separately count those who attended the boat show portion of the event, rather than the entire marine festival. These are good numbers. By way of comparison, the Dubai boat show drew 23,000 and 15,000 attended the most recent Shanghai show, Coventry says. Exhibitors say the layout more clearly outlines the separation between the boat show and the festival. "They&apos;re saying now what we&apos;re getting is the serious customer coming through the halls, not just people coming to look out of curiosity," Coventry says. Organizers say a combined 121,669 people attended the show and festival. That figure is down from last year largely because of heavy rain on the Saturday of the event. And while the number of exhibitors (204) was down this year, they were of a higher caliber and were better suited to the boat show. Last year more exhibitors were displaying sunglasses, cushions and other accessories not necessarily directly related to the industry, Coventry says. This year there were more "genuine" recreational marine companies, he says. Moon-Soo Kim said that his re-election in early June assures the continuance of the show and the dedication to growing the recreational marine industry in his province. "I have a strong belief whoever comes to our boat show is amazed," he said on opening day, noting how much it has grown in three years. Next year, he told a group of reporters, if you come back to the show - scheduled for June 8-12 - you will see two to three times the number of available marina slips, as well as the opening of the Gyeongin Canal, which will link Seoul with the Incheon coast and allow access to the Yellow Sea, among other developments. "It is a vision for the central government," Kim says. "The oceans have opened. There is huge potential."